Hello! I’m Faith and I write An Edible Mosaic. This is my recipe collection of international favorites and updated American classics, with an emphasis on seasonal dishes. I focus on real foods that sustain body and mind, bring people together, and make a house a home. Welcome to my mosaic of recipes. Subscribe to the RSS feed in the reader of your choice. 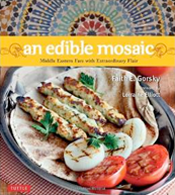 I’m Faith Gorsky, the writer, cook, and photographer behind An Edible Mosaic. My goal is to inspire you to get in the kitchen and try something new! Feel free to email me with questions or comments.